A recurring meme on Instapundit is: IS THERE ANYTHING TRUMP CAN’T DO? In December, four or five weeks after Donald Trump's election upset, a faithful reader of No Pasarán knew he could no longer put off a trip to the Department of Motor Vehicles in the Dallas area to get his driver's license renewed. Fully expecting something like a 3- to 4-hour stay, he let out a long sigh, set aside half a day to the task, prepared a ton of reading material to bring with him, and, carrying a heavy bag filled with magazines and books (no, not War and Peace), took off with a strong sense of foreboding. He parked his car, did the sign of the cross, and walked the last few steps to the Texas Department of Public Safety. When he opened the door, he did a double take: could he have chosen the wrong building? He stepped out again, and checked the address again. 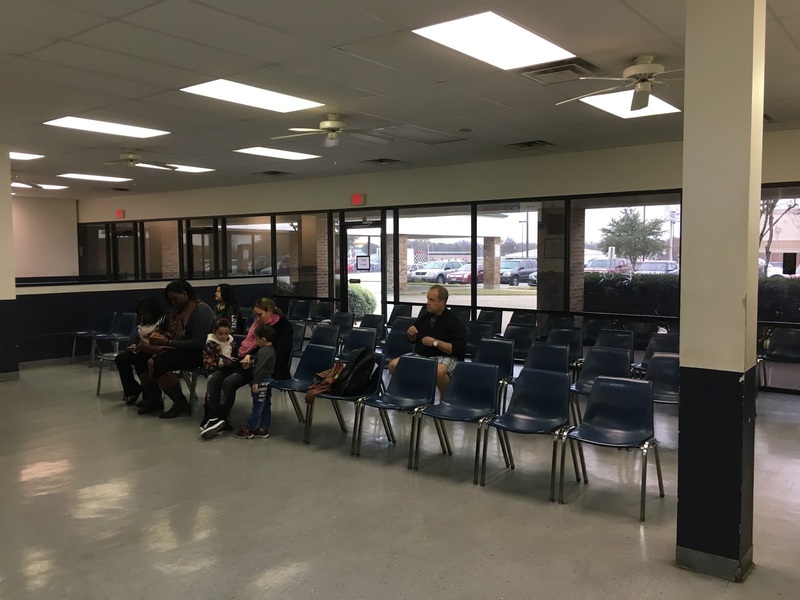 Inside, there were no crowds, no chairless people standing around in the aisles, no noise, no nothing — the DMV waiting room was virtually empty. Almost before he had a chance to sit down, there were only two people in front of him. Not five minutes later, his name, or his number, was called. Indeed, the time to process the information for the driver's license renewal took longer than the waiting time, and within 10 to 15 minutes, he was exiting the building, on his way to his car. He was giddy, he testified. Almost teary-eyed. Wasn't this a sign? Wasn't this a sign that Donald Trump's presidency promised to be a success? Punching Back Twice As Hard: A Mainstream Christian Ministry Files a Lawsuit Against the SPLC for Calling It a "Hate Group"
saying it defamed the Christian organization as an “active hate group” because it endorses the biblical view of homosexuality. … SPLC critics say its original mission was a commendable one, setting out in 1971 to fight the Ku Klux Klan. The SPLC went after several Klan leaders, driving them into bankruptcy after court losses. But increasingly, especially since Donald Trump’s victory in the presidential election, both liberals and conservatives say that SPLC has grown overzealous – bringing down its huge and very high-profile “hate-group” hammer on not just people and organizations that actually encourage hate and violence against certain groups, but also on those who simply don’t fall in line with liberal positions on hot-button social issues. As Elizabeth Llorente notes, "Members of other religious groups – including non-Christian groups -- … are also feeling pressure from the SPLC" — as Ben Carson and Ayaan Hirsi Ali can testify, and which Maajid Nawaz in fact did on Real Time with Bill Maher. Is it not strange that migrants from Syria and Iraq move to places like Germany and Sweden instead of to neighbors like Saudi Arabia and Kuwait? An interview with Daniel Pipes was republished by the German website Achse des Guten. Mr. Pipes, You have written that Angela Merkel's decision to open the border to over a million migrants in 2015 "will likely be seen as a turning point in European history." You are a historian, so, what do you mean by this expression? I expect that when the evolution of European civilization is studied in the future, August 2015 will be seen as a key moment. The decision to allow unlimited immigration into Germany has had profound implications for Europe by raising this issue in a more acute way than ever before, creating divisions both among native Europeans who are for and against large-scale immigration and between native and new Europeans. … Why are relations between Europeans and Muslim immigrants so fraught with tension? Practically speaking, see the world in terms of cultural and geographic zones: Westerners in need should stay in the West, Middle Easterners should stay in the Middle East, and so forth around the globe. Is it not strange that migrants from Syria and Iraq move to places like Germany and Sweden? They would be better off going to Saudi Arabia and Kuwait, where the climate, the language, the religion, and the mores are all like their own; plus, these countries are much closer to Syria. … Many Muslims of immigrant origins point to discrimination as a factor hindering them from fully integrating into German society. … How do you view Europe's response to Islamism? … Asked in 2015 to address the German fear of Islamization, Chancellor Merkel suggested that instead of fearing Islam, Christian Germans should learn more about their own religious roots and go to church more often. Your response? Merkel's infuriating reply is typical of the elites in western (not eastern) Europe who remain defiantly unaware of the problems that Muslim immigration creates. The reasons are several-fold: guilty feelings, living in a bubble, looking for votes, political correctness, and fear of being called "Islamophobic." The cover of Pascal Bruckner's "The Tyranny of Guilt: An Essay on Western Masochism." Because, as French novelist and essayist Pascal Bruckner explained in his 2006 book, La tyrannie de la pénitence, many Europeans feel deep personal remorse about the trio of imperialism, fascism, and racism, even when they themselves are not implicated in those evils. For some Europeans, white skin itself signals guilt. Accordingly, they feel compelled to show unlimited tolerance and goodwill to non-Westerners. The fact that non-Western peoples also sin does not register – which implies a certain arrogance, even racism: only white sins count. This sense of guilt is the more striking considering Europe's great advances. I remember visiting Finland in 1987 and thinking as I walked its streets: "This prosperity, freedom, rule of law, and democracy is what humanity has always worked toward and now it's been achieved." How strange that a Europe which attained such success today drowns in guilt, has too few children, and chooses not to protect itself from a rival civilization. As an historian, I say: Such weakness has no precedent. "Is Trump personally racist?" asks the NYT; "The few African-Americans in his inner circle respond with an emphatic No"
… more than ever, the question is being asked: Is Mr. Trump personally racist? The few African-Americans in his inner circle respond with an emphatic no. … Kara Young, a model who dated Donald J. Trump for two years before he married another model named Melania Knauss, remembers clearly bringing up her race with the real estate tycoon early in their relationship. As with so many issues, he steered the conversation to celebrity. “I never heard him say a disparaging comment towards any race of people,” she added. 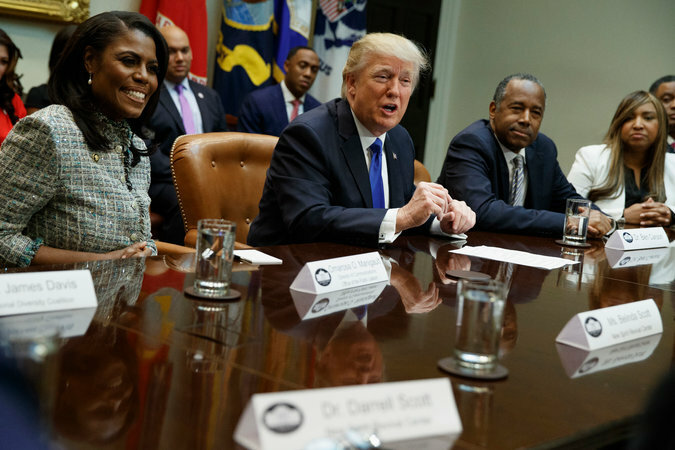 … Lynne Patton, who heads the Department of Housing and Urban Development’s New York and New Jersey office and is black, said Mr. Trump had a diverse set of people around him that included some close African-American associates, like Mr. Carson and Omarosa Manigault-Newman, a White House aide. Ms. Pierson [seated, in white, at far right in the photo above] said she was proof that Mr. Trump was not a racist because as soon as he decided to run for president, he hired her as a national spokeswoman for his campaign and encouraged her to speak on multiple television networks.